The most potent Siberian Eleuthero product available. Standardized formulation provides the full spectrum of active components, eleutherosides, in each capsule. Unique patented paste extract and pharmaceutical quality European capsule delivery system assures maximum absorption and assimilation. How is Sibergin different from Ginseng? Sibergin contains pure extract of Siberian Eleuthro the most researched herb in the world. Unlike its botanical ôcousins Korean Ginseng (overall stimulating) and American Ginseng (overall sedating), Sibergin is the ideal and all-purpose herbal adaptogen. Sibergin's active components called eleuthrosides produce a harmonious and natural balance between energy and tranquility for both men and women of all ages. 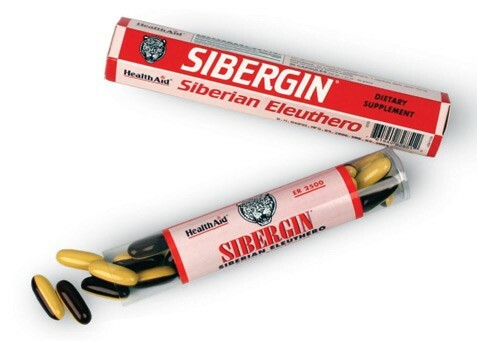 Used and prescribed by medical doctors, holistic practitioners and athletic trainers in Europe and America, Sibergin is and effective adjunct to any health-enhancing or athletic training program.